Phuket with land prices on this glorious island at record levels, the pace of development has slowed to a trickle. 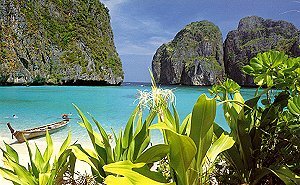 Which means that Phuket's wonderfully laid-back and tropical character remain as before. Visitors can also expect to find a beach or a bay to suit individual tastes. Patong is fast and glitzy, while Kata and Karon are serene backwaters. Year-round good weather, quality hotels at reasonable prices and the amazing choice of leisure pursuits mean that the island will continue to be one of Asia's hottest resorts in 1996. Phuket International Airport (Tel. 076/327320) is located on the northwest coast of the island, about 32 km northwest of Phuket town. There is currently no decent pubic transport system from Phuket airport to the beaches, so you are more or less obliged to take a taxi to your chosen destination. These cost about B400 to the main west-coast beaches of Ao Patong, Ao Karon, and Ao Kata, or about B300 to Phuket town. You can rent cars direct form the airport: both Avis ( Tel. 076/327358 ) and Hertz ( Tel. 076/327230) have desk in the arrivals area. "Fantasea of a Kingdom" is the ultimate in Las Vegas-style show that infuses Thai culture with magical illusions, 4-dimensional effects, aerial ballet, acrobatics, pyrotechnics, special effects, elephant circus (featuring over 30 elephants), and stunts into one unique and unforgettable theatrical masterpiece guaranteed to thrill and delight visitors of all ages or nationalities! Visitors can indulge in a sumptuous feast of Royal Thai and international delicacies, in the world's grandest buffet! Come to the enchanted Festival Village and shop for high quality locally made products and souvenirs. Enjoy cultural parades, craft demonstrations, elephant riders and much more more! Join in if you like! Located on Kamala Beach, just 9 km from Patong,Phuket FantaSea offers a one-of-a-kind experience of culture and fun that no visitor to Phuket should miss!